Classic Voyage to the Bottom of the Sea Episode--Submarine Sunk Here. 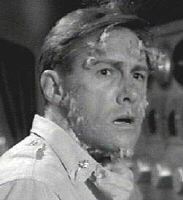 The episode "Doomsday" was Voyage's most direct flirtation with social commentary. 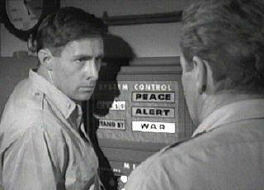 It was writer William Read Woodfield's opportunity to make a powerful statement about the madness of nuclear war. Considered a classic episode by many fans of the show (not all, as you will see), there can be no question that Doomsday has its heart in the right place. Click through for the expanded classic episode treatment of "Doomsday," and then come back for Mark and Mike's somewhat differing takes on the episode. 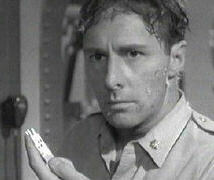 James Goldstone Says: "A lot of the guys playing crewmen on Voyage weren't given any screen credit. Back in those days, that was standard policy. They figured, ‘Who cares who played those guys?’ A few years later there was a new SAG law that required screen billing for actors. I’ve always been interested in reading the credits. Some years ago I was watching the end credits of a movie and when it was over, I was the only person left in the theatre. When I tried to leave, the doors had been locked and I was trapped. I had to bang on the door until someone let me out!" Donald Harron Says: "I thought it was an OK show. To have your finger on the doomsday button is like playing a classical tragedy. It is the reaction human beings have, to the possibility that everyone and everything they know may cease to exist, that was interesting to play. But I really tried not to think about the preposterous plot and instead enjoyed the camaraderie with my fellow actors. We got along great and had lots of laughs as we pretended to stumble and fall as the shock waves and depth charges went off. Jimmy Goldstone was a terrific director. His spirit was very enthusiastic and infectious. 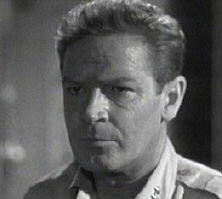 Richard Basehart was more anxious to talk Shakespeare than Voyage. I had always enjoyed his film work. He was a fine actor with a great noble face. He was much too genuine for the shallow politics of Hollywood." 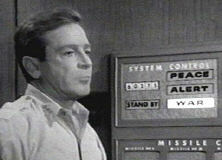 Mark Says: I have seen this episode several times and tried to like it and to call it a classic. I can’t. It has it’s moments. Donald Harron’s final confrontation with Nelson is well done, but despite the well-researched procedures of a nuclear war alert, there’s a curious lack of tension that ultimately results in tedium. Good acting and dialog but the results are rather empty. My standard for this kind of story, perhaps unfairly, is the film Fail Safe. This episode is no Fail Safe. Mike Says: William Read Woodfield's powerful cautionary script for "Doomsday" poses a horrible dilemma for both Nelson and Crane. They are duty-bound to carry out their orders in spite of the fact that to do so is madness. The writer is clearly on the side of missile officer, Lt. Cmdr Corbett, who pleads the case for humanity, arguing that there is a line past which individuals are not bound by orders. And at the conclusion of the drama, the viewer sides with Corbett in spite of the fact that his military career is ruined and Nelson is obviously the show's daddy/hero. Fairly bold stuff to air in 1964 during the cold war and a brewing Vietnam. 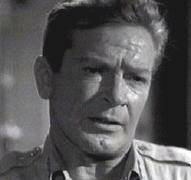 Donald Harron did a remarkable job of facing off against Richard Basehart, a task that many actors were not up to. He was. "Doomsday" is arguably Voyage's finest attempt to deal with social and moral issues and crackles with tension. At the heart of "Doomday's" power is the struggle between missile officer Corbett's conscience and his rebellion at the horror of their orders to stand-by to launch nuclear weapons. On the other side of the equation is Nelson's acceptance of duty even in the face of horror. One man speaks for humanity, one man speaks for his country. This episode openly questions Nelson's stand--there are no blacks and whites.